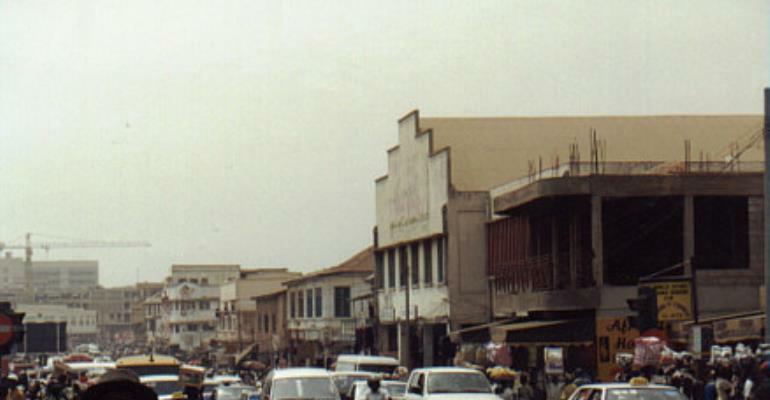 Accra, Feb. 8, GNA - The Accra Metropolitan Authority (AMA) on Monday evening began a decongestion exercise of the city by pulling down unauthorised structures along designated streets and on pavements within the centre of Accra. The combined team of AMA Task Force and personnel of the Ghana National Fire Service under police protection razed to the ground all tables, chairs, and stalls that impeded free movements of both human and vehicular traffic during the day. Mr Stanley Nii Adjiri Blankson, the City Mayor who led the demolishing team, which started the exercise at 2200 hours on Monday night, said the programme would last for two weeks. Starting from the street in front of the General Post Office, the decongestion exercise went through the Pagan Road, Kojo Thompson Road, Liberty Avenue, Independence Avenue, and the streets on the sides of the Rawlings Park. The exercise, scheduled to go through the Central Business District of Accra, would also go along the street on Cocoa House, Kwame Nkrumah Avenue, Merchant Bank, the Old Parliament House, Swalaba and then back to the General Post Office. A large portion of the broken chairs, tables, stalls and wooden structures, which were yet to be cart away to the Kaneshie Waste Management Yard, laid piled up on the pavements along the streets. The men of the task force went about the exercise without violence or threat to life as they were cautioned prior to the commencement of the exercise by the Mayor, "therefore do not use any cane, belt and gun, for these are not the times of the "Aaaba ei" when guards molested and harassed people who sold on the streets", the Mayor advised. "We want to claim what belongs to the AMA" Mr Blankson told the task force team in a pre-departure encounter. He said the gutters too would be de-silted, and as part of the exercise, the defaced walls would be repainted to give the city a facelift. Mr Blankson said the exercise had the support of the Gas traditional chiefs and the churches, adding that, he would step on some big toes with the exercise, but he would continue to fight, and pointed out that " it is better to offend some few people, than to incur the displeasure of the four million people" in Accra. Mr Blankson said permission had been granted him to set up a special court to deal with cases in the aftermath of the decongestion exercise. Mr Noel Arcton-Tettey, Public Relations Officer of AMA said the exercise was sponsored with funds from the AMA and support from the banks that operated within the central part of the city.